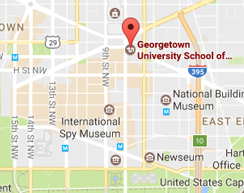 Georgetown has additional requirements for international applicants. If you are an international applicant who requires F-1 or J-1 visa support, you must submit the following application materials by the priority deadline to ensure necessary time for visa documents to be processed. Application requirements found on the How to Apply page. Official transcripts: WES or ECE course-by-course evaluation for all institutions attended outside of the U.S.
TOEFL or IELTS scores: TOEFL:100 (iBT), 600 (paper-based test), or 250 (computer-based test). IELTS: 7.0. You have a degree conferred from an institution where the language of instruction is English. Your native language is English. *Is your TOEFL score below 100 or IELTS score below 7? We encourage you to enroll in the Georgetown ELC Intensive English program to improve your academic English skills if you do not have the minimum TOEFL or IELTS score. The number of semesters needed depends on a test of your language proficiency. Once you successfully complete the advanced level of the Intensive English Academic track, you may submit your degree application for review and email the admissions advisor documentation showing you have completed the Intensive English program. Admission to degree programs is not guaranteed. If you have any questions regarding these policies, please contact the Office of Admissions.